I make no claims of being a great crafty DIY person. So when my son said he wanted a Minecraft themed birthday party I did what most American moms would do I googled "minecraft party decorations." I was shocked that there was hardly anything available for purchase in the category. So I turned to pinterest for other options. Follow Shanna's board Minecraft Birthday on Pinterest. Given that our setting was a picnic shelter at a park, our decor options were limited to tabletops and a pinata. After looking at pictures of other pinatas, Jonah came up with a conceptualization of one with a Steve face on one side and an Enderman on the other. His got his dad to putting it together according to his vision (a CEO in the making I guess). I took this idea for grass dirt blocks from pinterest, but used the cocoa crispies instead of rice crispies to make it look more like dirt. They were a huge hit with the extended family. And did I buy or make that gorgeous cake shown at the top of this post? Nope. I bought some stickers from an online party store that aren't Minecraft per se but are mining related - the kids stuck them to popsicle sticks for inserting into cupcakes and voila you have cupcake toppers (and yes, they were store bought cupcakes). We also used strawberry and licorice flavored twizzlers to make some Minecraft TNT. This is a common minecraft party food and can be packaged numerous ways. We did purchase a Minecraft Papercraft Animal Mobs Set to assemble and use as table decorations. They doubled as party favors for our few child guests. Jonah added a couple of his action figures to the tabletop display as well. 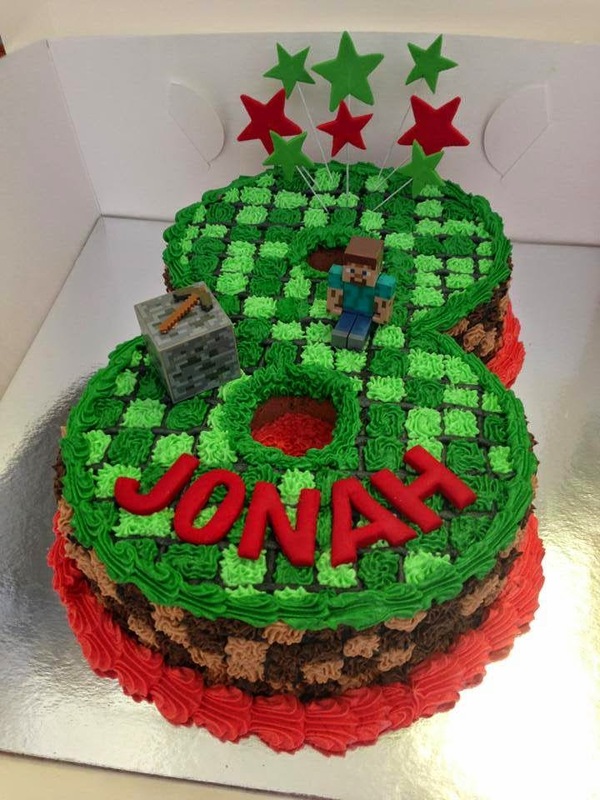 In the end, Jonah was very happy with his Minecraft birthday and I didn't overly stress or overspend on cake and decor. Success!